Hello everybody, just a few more short weeks and we'll all be able to get outside and do the things we love! Until then I wanted to share with you some exciting news. We, Swindler and Sons Florists, are getting ready for a great business expo at Roberts Arena (March 5-6). We will be featuring our new Garden Center offerings for Spring 2010. Over the next few weeks I will introduce you to many of these annuals, perennials, vegetables and even a "square foot garden kit". One of the biggest changes for us this spring will be the number of different tomatoes that we will be growing. In years past we have grown as many as 20 different tomatoes, but because of the incredible passion we have seen from many of you we will attempt to grow more than 70 different varieties of tomatoes. For an old-time tomato taste we selected over 35 new (to us) heirloom tomatoes. With names like Black Krim, Box Car Willie, Radiator Charlie's Mortgage Lifter, Amish Paste, Great White, Hillbilly, Arkansas Traveler, Brandywine and Caspian Pink, you know they are going to be good. We will still be growing our established hybrids Better Boy, Early Girl, Jet Star, Heartland, Yellow Boy, and Beefmaster, but will add new varieties like Brandyboy, Big Beef, Pink Girl, Scarlet Red, Red Defender and Moreton. Over the next few weeks I will go in greater detail on some of these varieties as well many others not yet listed. I will also talk about our Bicentential plans for the Main Street plantings, new selections of annuals that take our July-August heat as well as top performing perennials. 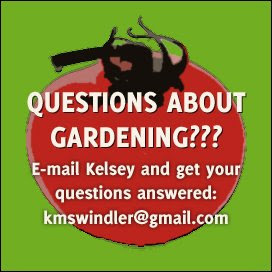 We welcome all your gardening questions and if we can't answer them we'll make something up! Just kidding, we'll be happy to research your question. Demo Garden gets compost bin! The demo garden now has a compost bin! We constructed a three bin compost pile out of chicken wire and small metal posts, but there are different sizes and designs of bins out there. You can make your own or there are many pre made ones ready to buy. Making compost is simply helping to facilitate the natural cycles of growth and decay. If you’ve taken a walk in the woods you have seen compost in its most basic setting. Plants and animals that die over the course of a season decompose on the forest floor. This creates a rich soil on the forest floor. Your garden soil can be greatly improved by adding your own compost. Compost releases the nutrients that were once found in the decomposing materials into your garden. It is a great organic alternative to adding chemical fertilizers. When applying synthetic fertilizers you are usually just applying nitrogen, potassium, and phosphorus. Compost supplies those elements as well as many others such as boron, copper, zinc, iodine, and iron. The organic matter in compost binds to soil particles, which helps sandy soil retain water and clay soil drain better. This action also allows for more air space in the soil, which helps roots to grow. Compost can also provide nutrients, moisture, and habitat for beneficial organisms living in your soil. You can put your kitchen scraps, grass clippings, weeds, dead leaves, straw, livestock manure, & some paper into your compost pile. By composting these materials you can save up to 20% of your trash from going into the landfill! A sunflower is blooming in the demo garden! I love sunflowers. They are a symbol of summer, are beautiful and have a nice smell to them. I like them so much that earlier this summer I camped out in our patch at home! The big, beautiful acorn squash plant in the demo garden doesn’t look so pretty anymore. It has developed powdery mildew, a fungal disease. This disease affects many different plants, but squash is one of the species that are especially susceptible. Each species contracts a different type of powdery mildew, so this fungus should not transfer onto any other plants in our garden. Powdery mildew is whitish gray covering over leaf surfaces and other parts of plants. It is usually caused by high humidity, which plantings in the shade, lots of dew, and close plantings can contribute to. This fungus can impair photosynthesis and extract nutrients from plant, causing a decline in the health of the plant. Leaves will probably turn yellow. If powdery mildew is really severe it can prevent buds from forming into fruit on the plants. Our Acorn squash already has many large squashes on it, so we will have to wait and see how they ripen. cucumbers, an eggplant, a kohlrabi, a couple of habanero peppers, more turnips and more herbs. The marigolds are blooming around one of the beds, making a pretty border around the tomatoes and peppers. I cut down the rest of the buckwheat and turned the entire plot under last week. Since we got the demo garden planting pretty late and this summer hasbeen pretty cool we are still waiting on our first tomato, but they are turning! Nonetheless, tomatoes are now abundant at the farmers market and in our home gardens. I love the wonderful smell that tomato plants possess. I enjoy caring for tomatoes, transplanting, suckering (even if it does stain your hands black), stringing, and picking them. I like seeing the different varieties, in all their different shapes and colors. The only thing I do not like about tomatoes is eating them. I’ll admit this is pretty abnormal (especially for someone that has 800+ tomato plants at home)! I simply do not enjoy the taste of tomatoes. However, I have found a salsa recipe that I believe is delicious. It is a verysimple recipe for making fresh garden salsa. Even though it takes a little while because you have to let the tomatoes sit and drain, it is easy to make, so try it out! Core and dice tomatoes in medium bowl. Add salt and let drain for about an hour. Pour off juice. Add the rest of the ingredients. Chill one hour. Enjoy! Every time I visit the demo garden I am struck by how wonderfully it is growing. I really enjoy visting and working in the garden because there is always something new to observe. Last week the demo garden changed its look slightly. 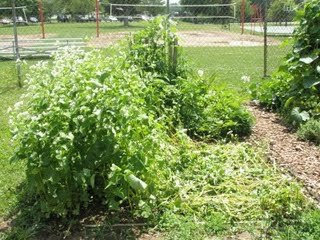 The Haricot vertical bush beans and the Goldrush bush wax beans were harvested and the plants pulled out. The beans were so pretty that I just had to eat one of the yellow wax beans before the volunteers took the pile of beans home. The acorn squash plant is huge! We pulled the bean plants out as soon as we harvested the beans to make room for the monstrous plant. The plant has many small squashes on it. The plant and the weird shaped (acorn looking) squashes are provoking many comments from all of the volunteers, as well as one of the park employees who is looking forward to trying one as soon as they are ready to harvest. I also chopped down half of the buckwheat and am going to turn it under with a shovel this week. This will allow the plant to decompose in the soil and release its nutrients for our next planting. The buckwheat has grown so much (it comes up to my waist now) and is covered in small, attractive, white flowers. The bees are enjoying the buckwheat flowers even more than I am! Every time I go to the garden the flowers are covered in bees of all sizes, which isn’t too much of a surprise since buckwheat honey seems to be popular. It is a wonderful sight! For more information about buckwheat and cover crops check out my post from a few weeks ago. Herbs take up a section of the demo garden with Sweet Marjoram, Basil, Dill, Coriander, and two kinds of Parsley growing. These are a nice addition to the garden because they can be harvested almost constantly throughout the summer and add a really nice touch to dishes. My family planted an herb garden along the back of our house this year and I am trying to remember to utilize them as possible this summer. Herbs always seem a little tricky to me. I am never quite sure how you are supposed to pick each herb, when to cut, if I am supposed to pick the flowers off, how much water they need, how to preserve them, etc. For help with these questions and others, visit the West Virginia Extension Service’s site about growing herbs in the home garden. Herbs not only add great flavor to recipes, but they also prove their worth as good sources of vitamins and minerals. Marjoram contains calcium, phosphorus, potassium, magnesium and vitamins A and C. Basil is rich in magnesium, manganese, and vitamins A, C, and K. Dill contains calcium, iron, manganese, and Vitamins A and C. Coriander is full of Vitamins A, K, B, C, E as well as calcium, potassium, magnesium, and phosphorus. Parsley is the stand out herb, as far as nutrition is concerned, being a great source of Vitamins A, K and many B vitamins. I’ve even heard that it contains more Vitamin C than some citrus fruits! Parsley also has iron, calcium, potassium, copper, manganese, and iodine. This is enough to convince me that I need to make an effort to add some spice to my cooking. Not only will my taste buds benefit, but my body will as well! Late Blight: A Lesson in Buying Local? If you have kept up with news in the Northeast, or the vegetable blogosphere, you may have noticed the term "late blight" cropping up in articles with overtones of desperation. My first exposure was an article by the New York Times entitled “Outbreak of Fungus Threatens Tomato Crop,” accompanied by a picture of some seriously sickly tomatoes (picture from NYT shown at left). Being the professed tomato enthusiast that I am, this headline immediately caught my eye as I scanned the homepage a few weeks ago. And it has only continued to infiltrate the news. 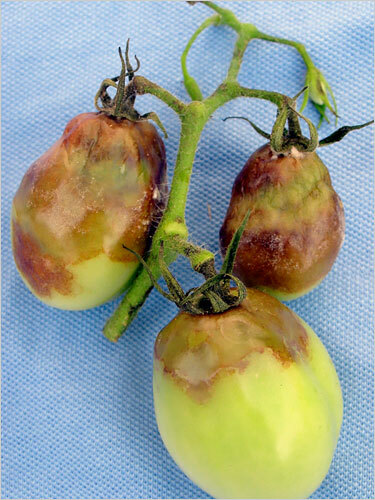 The fungus, called late blight, acts according to its name—it typically strikes tomato plants late in the season (around August or September) when conditions are cooler. The spores of this pathogen, officially titled Phytophthora infestans, are found in the soil and are incredible contagious, meaning that small outbreaks, while not uncommon, can be devastating. But this year the Northeast region, New York in particular, is experiencing a particularly wet June, which has caused a widespread outbreak that is both unprecedented and economically devastating. In an area that typically sold locally-grown tomatoes at or below $20 a box (wholesale), consumers may soon be paying up to $40 a box. Doubling the price could be extremely harmful to area growers, and the farmers markets that display their wares. And with cases being reported as far west as Ohio, it is important that even mid-west growers are wary of this disease and its implications as the spread continues. “Professor Fry, who is genetically tracking the blight, said the outbreak spread in part from the hundreds of thousands of tomato plants bought by home gardeners at Wal-Mart, Lowe’s, Home Depot and Kmart stores starting in April. The wholesale gardening company Bonnie Plants, based in Alabama, had supplied most of the seedlings and recalled all remaining plants starting on June 26." Now, it is important to remember that big-box stores like those listed above, and even Bonnie Plants, are not responsible for the outbreak. This fungus has been around for years and the weather conditions have abetted its spread tremendously. But, the very nature of these larger stores makes it easier for pathogens, such as late blight, to spread more easily. Because, to echo the statements of Mr. John Mishanec (a pest management specialist at Cornell also quoted in the article) these garden centers are not required to undergo inspection by the Department of Agriculture, and their employees are not often trained to spot harmful diseases. Having worked in my family’s greenhouses for over six years I can fully appreciate this statement. Each spring, John Day, who works for the Ohio Department of Agriculture, stops in to check out our Garden Center. Because he comes in every year he knows his way around, and usually just gives one of us the heads-up before meandering about the facilities. This visit results in a quick report and oftentimes a few updates concerning common “ailments” for the region (some years we are on the lookout for spider-mite on roses, some years its blossom end-rot, and some years it is simply aphids). His inspection, along with my Uncle Gerry’s degree in Horticulture, makes it possible for us to spot diseases/pests early on and treat them accordingly. This essential responsibility, to us, is simply another "given" when buying from local growers. Unfortunately, this is the guarantee you won’t always get at a big-box store. Now, I have done some checking around to see if late blight is something we ought to be worrying about in our region. After speaking with Tony Nye, OSU Extension Educator in Agriculture, and John Day, our Department of Agriculture inspector, it doesn’t look like late blight is cause for concern in our region just yet. This was reiterated by area farmer Brad Bergefurd, who reported similar symptoms in a few plants, but nothing that has been confirmed. (All three mentioned Blossom-End Rot as the larger concern for our region, for more information check out my earlier blog entry HERE). To be safe, however, be on the lookout for symptoms of late blight, which include brown spots on leaves, fungal growth on underside of leaf (sometimes white), black spots on stem, and firm brown spots on tomato fruit. For another grower’s perspective, and a personal account from the Northeast, check out the article Tomato Disappointment: A Farmer’s Perspective on Late Blight in the Northeast. For a profile of the pathogen itself, check out this Science Daily article HERE. As Maggie mentions below, Last Friday (7/24) the ECC Demo Garden was bustling with young YMCA campers who were visiting for a workshop on the importance and value of local foods, gardening, and sustainable growth. ECC’s Maggie Ashmore worked with Eric Guindon of Wilmington College’s Grow Food, Grow Hope initiative and Phil Swindler of Swindler and Sons to plan the programs. 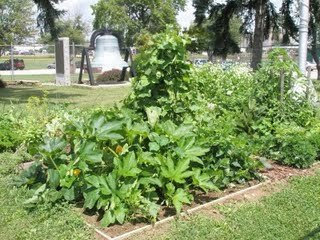 The demonstration garden was established this past spring by Energize Clinton County to illustrate both the nutritional and economical benefits of having a small-plot garden. The demonstration garden serves as a way to increase public awareness and provide a valuable educational tool for people of all ages. For Energize Clinton County, supporting local growth is critical to its mission to promote sustainable development. Along with the demonstration garden, ECC facilitates the Clinton County Farmers Market and the Buy Local First campaign in order to further stimulate the growth of the local economic foundation in Clinton County. Also, please check out GFGH’s John Cropper’s excellent piece in the 7/28 Wilmington News Journal on Friday’s activities. ECC has published a document with the Grow Food Grow Hope (GFGH) initiative detailing the recent youth education program held last Friday at the ECC Demonstration Garden in J.W. Denver Williams Memorial Park. The document is available for download by clicking on the picture to the right. Last Friday Eric Guindon, Mariah Fulton, Phil Swindler, Kelsey Swindler, and I led a program about gardening for 32 YMCA day campers at the demonstration garden. I was impressed by the knowledge that the campers already possessed about gardening and food issues. I was also amazed by their enthusiasm to participate in each activity. I think the program went well and I hope the kids had as much fun as I did. For more information about last Friday’s program please read John Cropper’s blog post about it on the Grow Food Grow Hope site or his article in the Wilmington News Journal! At Energize Clinton County, we believe locally produced food is a vital component of a more sustainable community and economy. This summer, we'll be taking part in the time honored tradition of back yard gardening, as well as digging-in and cultivating a demonstration garden at Denver Williams Memorial Park with help from the Clinton County Master Gardeners. This blog is our outlet for documenting and sharing our experiences. With the help some guest bloggers, we hope it will provide an informative, engaging, and entertaining format for learning and appreciating the process of growing food in Clinton County.